See the Nimrod Lake website for additional information. Primary recreational opportunities are listed below. Directions: Located in the west, central part of the state. From Hot Springs, go 40 miles north on AR 7. From Russellville, go 20 miles south on AR 7 to Ola, then take AR 28 5 miles west to Plainview. From Plainview, take AR 60 east and all the park entrances will be located to the south of the highway. From Little Rock, go 40 miles west on AR 10 to Perryville, then 20 miles west on AR 60 to Fourche Junction (the intersection of AR 60 & 7). Continue traveling west on AR 60 and park entrances will be on the south of AR 60 for the next 9 miles. 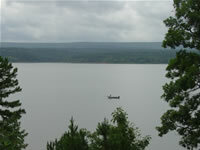 Factoid: Cradled between the Ouachita and Ozark Mountains, Nimrod Lake is popular with fishermen and hunters alike. Six parks nestled along the lake provide modern camping facilities and an opportunity to relax amid the groves of tall, sweet-scented pines. Nimrod is conveniently located adjacent to State Highway 7, a National Scenic Byway and other nearby points of interest like Petit Jean State Park, Mount Nebo State Park, and Hot Springs National Park.